(sled・ded; sled・ding) 自動詞 そりで行く[に乗る]; そり滑りをする. From Middle English sledde, from Middle Dutch sledde or Middle Low German sledde (compare Dutch slee, slede, Low German Sleden), from Proto-Germanic *slidô (compare Saterland Frisian sliede, German Schlitten, Norwegian slede). Related to slide. The child zoomed down the hill on his sled. "Mush!" he yelled at the dogs pulling the sled. (intransitive) To ride a sled. (transitive) To convey on a sled. A sled (American English) or sledge (British English) is a sliding vehicle designed to transport passengers and/or cargo by using a running mechanism and smooth undersides instead of wheels. 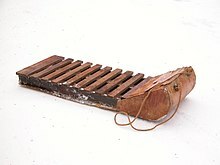 Most sleds are used on surfaces with low friction (such as snow or ice), but, in some cases, mud, grass, or even smooth stones make a good surface for sleds.